" TEPCO is 'Very Sorry': Radiation Spikes as Work to Stabilize Fukushima's Nuke Plant Remains Perilous	"
"The number is not credible," Tokyo Electric Power Company (TEPCO) spokesman Takashi Kurita told reporters on Monday in Japan, apologizing for the error. "We are very sorry." Kurita was referring to their alarming report on Sunday night (local time) that radiation from iodine-134 in water of the basement of the turbine building at Fukushima Daiichi's Unit 2 reactor was 10 million times higher than the normal level, leading workers to another hasty evacuation of the plant. That number, Kurita explained, turned out to have been an incorrect reading. But just when you thought it was safe to go back into the water...Turns out the radiation levels in the flooded water at Unit 2 were actually "only" 100,000 times safe levels. Mark McKinnon, the East Asia correspondent for Canada's The Globe and Mail may have said it best when he tweeted: "Congrats to TEPCO for finding a way to make radiation '100,000 times normal' sound almost like good news." The company had come under fire the day before when they admitted that they had known about high radiation levels in the puddled water at Unit 3, but failed to alert workers laying power cables in the basement trying to restore electricity to the unit. Three of them were burned by the radioactive water when it came over their boots while working in the wet darkness. Two of them were hospitalized. 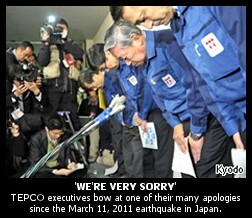 TEPCO apologized for that too. On TEPCO's website even today, the company offers a section on "Corporate Ethics and Compliance". On that page, they explain how --- following a 2002 scandal which rocked the company and led to the resignation of their president, vice president and chairman after it was discovered the corporation had been been hiding safety violations for a decade by falsifying inspection reports --- "TEPCO implemented countermeasures to guard against a reoccurrence of incidents with regard to inspection and maintenance operations at our nuclear power stations." "Through conducting thorough information disclosure," they explain, "TEPCO has established a system of independent inspections, and is highly transparent in the operation of its power generation plants." As president, I will place high priority on making TEPCO a strong and competent company that can promise development and growth into the future and on improving public confidence in TEPCO, including the confidence of communities surrounding our power stations. Not sure how much "confidence" the "communities surrounding [their] power station at the Fukushima Daiichi plant currently have in the company, but the snarky comments here largely write themselves, so we'll leave that to others. AP offered an investigative report on Sunday by Justin Pritchard and Yuri Kageyama, in which they charge that TEPCO "dismissed important scientific evidence and all but disregarded 3,000 years of geological history," when designing their safeguards "against a killer tsunami". AP reports the company simply ignored historic evidence of past tsunamis of the size which crippled the Fukushima plant following the 9.0 earthquake on March 11. They downplayed the risks, and the government allowed them to do so. Just like in the wake of 9/11 and Hurricane Katrina and the BP oil disaster in the Gulf of Mexico in the U.S., Japanese government and TEPCO officials have claimed, according to AP, that "no one could have anticipated" the events that have hobbled the Fukushima nuclear plant, leading to the world's worst nuclear catastrophe since the Chernobyl meltdown in 1986. No one could have anticipated it --- other than those who did, but were ignored, like those who are still being ignored in regard to similar safety concerns about nuclear plants in the U.S. even today. As BBC journalist Greg Palast revealed earlier this month (our interview with him is here), plans are currently in the works for TEPCO to build two new nuclear reactors on the Gulf Coast of Texas. Meanwhile, neither company nor government officials have a definitive explanation for the spiking radiation levels at the Unit 2 reactor building, though TEPCO said on Sunday they believe it's coming from the reactor. In a press conference on Monday (local time), according to Reuters, government officials were attributing the radiation in the water flooding in the basement to "a partial melting of fuel rods after the March 11 earthquake and tsunami." "The radiation seems to have come from fuel rods that were partially melted down and came in contact with the water used to cool the reactor," Chief Cabinet Secretary Yukio Edano told reporters. Reuters said "His comments suggested there was no crack in the containment vessel in reactor No. 2, as some had feared, and he was not suggesting that there had been a fresh meltdown." Edano explained: "The airborne radiation is mainly contained within the reactor building. We must make sure this water does not seep out into the soil or out to sea." But at least some of that radiation has already seeped into the sea. On Saturday, radiation levels 1,250 times normal were discovered in sea water near the Fukushima Daiichi plant. By Sunday, that level had increased to 1,850 times normal. "We have somewhat prevented the situation from turning worse. But the prospects are not improving in a straight line and we've expected twists and turns," Edano said in his presser. "The contaminated water is one of them and we'll continue to repair the damage." At another press conference, TEPCO vice-president Sakae Muto said, "Regrettably, we don't have a concrete schedule at the moment to enable us to say in how many months or years," before this crisis will be fully over. Elsewhere, over 200,000 thousand turned out on Saturday in Germany to protest nuclear power, while Japan saw smaller protests on Sunday, as citizens there seem to have a renewed interest in opposing nukes, for some reason. On Monday, Japan's National Police Agency announced the confirmed number of deaths from the March 11th earthquake and tsunami had risen to 10,872 while more than 16,200 remain missing. As we noted in our Fukushima report on Thursday, with the toll of the dead and missing at 27,000, that number equates to some 68,000 Americans lost in a single day here in the U.S., if our relative populations are taken into account. For further perspective, the estimated cost of damage in Japan remains around $300 billion, while the estimated cost of 2005's Hurricane Katrina was approximately $81 billion. The worst natural disaster in the history of the U.S., in terms of deaths, was the 1900 hurricane in Galveston, Texas, in which 6,000 to 12,000 died --- again, by way of comparison to what Japan is now coping with, in a country with a population well less than half of ours. 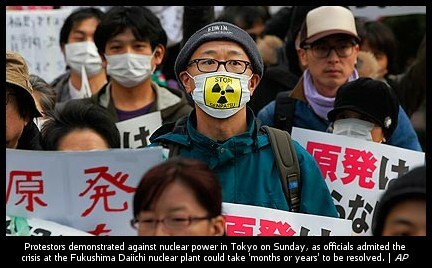 Please see our previous detailed update on Fukushima. Most of the specific details in that report remain operative at this hour, including information on new scientific analyses from around the world suggesting that Fukushima may be approaching Chernobyl levels of emissions, as based on independent analyses of several independent data streams by a number of scientists around the world. Also, we continue to post breaking updates on the Fukushima nuclear disaster, around-the-clock as they occur, via our Twitter account: @TheBradBlog. « PREVIOUS STORY "One Sign of Hope on Japan's Long Road to Recovery"
"TEPCO is 'Very Sorry': Radiation Spikes as Work to Stabilize Fukushima's Nuke Plant Remains Perilous"
This probably illustrates what Huxley meant when he said that in the future Big Brotherdom would find a way to make people love their virtual servitude to an inhumane system. With regard to Japan and the stream of apologies emanating from there, cynically I ask whether it is better to be thought of as politely incompetent than to be seen as willfully stonewalling about a disaster, so that the frog (public) comes to the boiling point very slowly rather than suddenly finding out the truth on Day 1? "How will we tell the -children- citizens?" This "we haven't verified the condition of the reactor" reminds me of "well, that MIGHT have been Osama Bin Laden's voice but....we have to check." The point with the reactors may be to get people accustomed gradually to the fact that an unknown number of people in Japan and elsewhere are in deep sh*t.
In an age where satellite photos online can show me the details of my backyard, I struggle to tally that with the fact that we are being asked to believe that nobody possesses a higher level of detail about what's going on in buildings with the tops blown off? This story that we can't get close enough? I'm not buying it. We're not even hearing what the satellites can and cannot see. A possible reason the details are not emerging: Because if they did emerge, nuclear scientists not associated with the company or government would say, "the assessment is not in line with the facts," or would say, "they did WHAT?" or even "I looked at the specs for this plant and if it was built as designed, this never should have happened." When regulators are captive to the industry they regulate, sh*t happens, it's only a matter of 1) the exact date and time, and 2) whether the public finds out. When there's no oversight, management focus shifts from making actual improvements to insiders finessing the story line to be given to outsiders, and to masking and rationalizing the true condition instead of e.g. upgrading rigorously. Those with inconvenient information are defined as the enemy, and the wagons are circled around eliminating the critic, not eliminating any genuine identified safety threat. Part of eliminating the threat of outsiders is to create a wide circle of insiders in all the right places. Given the amount of corporate money that has to flow to any program in nuclear engineering, how much should we trust academic spokespersons without knowing who their grants come from?. If the researchers take a big chunk of change in order to do a favorable bit of research, then it can become a real problem to figure out who to turn to for accurate, unbiased info. Again, this is a familiar template for any number of recent major fiascos. MODELING: You can take the engineering models for Katrina, the financial models for 2008 crash, or the nuclear accident models for Fukushima Daiichi --- When models are used to predict events but garbage assumptions are used, the predictive value of the model will suffer, BUT WHO'S LOOKING? As with poorly designed or rigged public opinion polls coupled with the skewed "analysis" of them that pollsters may provide, few citizens discern the faults in the designs --- they just take the bottom line and retweet it as received wisdom. Predictive models may be used in service of the desired project budget rather than in service of the public's safety. And who is most sophisticated at using them? Probably the company, not the regulators. In the nuclear industry, as in finance, the base subject matter is highly technical and thus the number of citizens who actually *could* provide oversight is limited. Snow jobs? Just one more tool in the bag. Further, in both industries, the programs that educate students to pursue careers in the industries are not educating regulators --- they are educating the next round of players. The society has the belief that science is objective and good, and this belief has been conveniently usurped by creating scientific results in the corporate interest, but still passing it off as objective and good. There's another aspect of the spate of fiascos that I haven't really seen explored or examined. Who calls the shots in these companies now compared to in 1974 or so when many were built? Have they changed hands? Way long time ago, you rose through the ranks of a company with subject matter and operational management expertise and eventually had a level of broad and deep experience that prepared you to lead. Has that changed after the 1980's wave of leveraged buyouts of companies and investor groups buying up every type of company you can imagine? And has the MBA pushed people up the ladder for their smarts, ungrounded in a depth and breadth of experience? I'm just looking at whether the nature or quality of decision making has changed over the decades in industries that have faced these fiascoes. Finally, there's the focus on the profit for the next quarter and the fast movement of money in the markets. What impact does that have on the spending on safety? The reason all this is important is that you can go down the rabbithole of technical details and get really confused and be unsure if a plant is safe or not OR you can look at the basic structural aspects of how we're doing business and do one of those great predictive models --(NEVER MIND the myriad technical details that'll confuse you and make you feel inadequate as a citizen every time) --- as to how likely it is that getting in bed with the educators, the regulators, and the legislatures is going to lead us to a disaster 1) sooner or 2) later? Coming back to the current disaster, it would be interesting to know who/what educational background manages TEPCO and calls the shots and the same for the regulators there --- with eyes open to find out to what degree financial investor types without relevant industry experience have disproportionately ended up running or calling the game-changing shots at many high tech companies as a result of the money being concentrated in fewer and fewer hands, many of them skilled at manipulating money but not necessary skilled in the subject matter at hand. I don't know how we get out of this mess, but there are layers and layers of lack of integrity piled deep in all these fiascos. Coincidence? So endeth today's thoughts in the shower. Kansai area hospitals and the Osaka Prefectural Government say a growing number of pregnant women from the devastated Tohoku region, as well as some in Tokyo worried about the possible effects of radiation from the Fukushima nuclear crisis, are moving to the area to give birth. Jeffrey Merrifield was a Clinton and Bush appointee on the five-member Nuclear Regulatory Commission from 1997 to 2008 before leaving to become an executive at the Shaw Group, a construction giant that has provided services to 95 percent of all U.S. nuclear power plants. Making Merrifield's new role all the more interesting, is that he was in 2009 found guilty of ethics violations for pursuing jobs with several large nuclear corporations --- including his current employer, the Shaw Group --- while he was still on the commission and casting votes on matters in which those firms had a financial stake. He is now a senior vice president in Shaw's Power Group. Too much secrets around here. What about this one, published years before this recent Japanese quake. When he (Gordon J. F. MacDonald) wrote his chapter, "How To Wreck The Environment," for the book Unless Peace Comes, he was not kidding around. In it he describes the use of weather manipulation, climate modification, polar ice cap melting or destabilization, ozone depletion techniques, earthquake engineering, ocean wave control and brain wave manipulation using the planet's energy fields. He also said that these types of weapons would be developed and, when used, would be virtually undetectable by their victims. "Entire Island Of Japan Ordered Evacuated"
One you will never see - not because it's not warranted, but because it's physically impossible. The reasons for the near-total media blackout are myriad - but this tops the list. Boiling frogs by the millions - all the while, apologizing for the heat. Or because it's not warranted. Since the Fukushima accident we have seen a stream of experts on radiation telling us not to worry, that the doses are too low, that the accident is nothing like Chernobyl and so forth. They appear on television and we read their articles in the newspapers and online. Fortunately the majority of the public don’t believe them. I myself have appeared on television and radio with these people; one example was Ian Fells of the University of Newcastle who, after telling us all on BBC News that the accident was nothing like Chernobyl (wrong), and the radiation levels of no consequence (wrong), that the main problem was that there was no electricity and that the lifts didn’t work. “ If you have been in a situation when the lifts don’t work, as I have” he burbled on, “you will know what I mean.” You can see this interview on youtube and decide for yourself. What these people have in common is ignorance. You may think a professor at a university must actually know something about their subject. But this is not so. Nearly all of these experts who appear and pontificate have not actually done any research on the issue of radiation and health. Or if they have, they seem to have missed all the key studies and references. I leave out the real baddies, who are closely attached to the nuclear industry, like Richard Wakeford, or Richard D as he calls himself on the anonymous website he has set up to attack me, “chrisbusbyexposed”. Tepco deserves all the criticism as it lacks transparency and makes too many mistakes. The statement like this one just deepens unease about country’s future. The company like Tepco should provide information more promptly to make the Japanese feel less stressed. Evidently there is a meltdown where the core melted through one of the containment vessels according to the Guardian.